Los Angeles County firefighters used an aerial ladder to rescue a 12-year-old boy from a steep slope near George's Gap north of La Canada Flintridge on Sunday, Jan. 10, 2016. 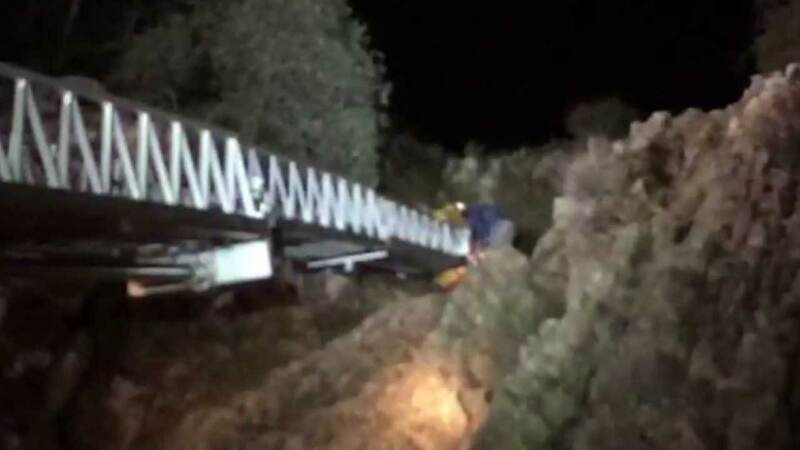 LA CANADA FLINTRIDGE, Calif. (KABC) -- Los Angeles County firefighters used a 100-foot aerial ladder to rescue a 12-year-old boy who became stuck on a cliff in the Angeles National Forest Sunday. Capt. Brian Jordan said firefighters found the boy on a steep slope near George's Gap north of La Canada Flintridge. A firefighter then climbed up the ladder and was able to bring the boy down to safety. The boy's father was on a ledge above him and was able to walk to safety. The boy was cold and missing a shoe but otherwise OK. He was treated at the scene and released.